The New Jersey Devils won the Entry Draft lottery despite the NHL’s fifth-worst record and just an 8.5% chance of landing the top spot. In all they selected 11 prospects – six forwards (four centers along with a left and right wing), four defensemen (three in the final round) and a goalie. 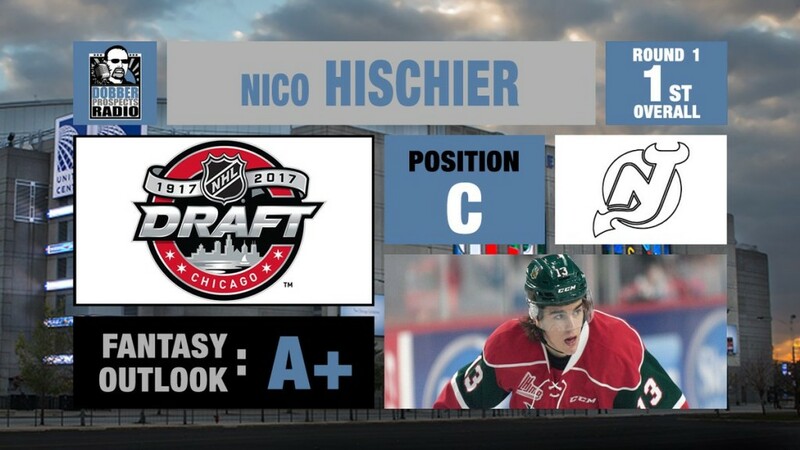 General Manager Ray Shero and his scouting staff ultimately settled much debate by using the first overall pick to bring Swiss sniper Nico Hischier into the fold. Hischier showed he’s an absolute offensive terror in his initial QMJHL campaign. The Swiss puck-wizard is lightning quick on skates and seems to out-think and out-maneuver opponents before they know what hit them. Elite hockey sense combined with an elusiveness that’s tops in his class, he’s very gritty for a breakneck tilt scorer, willing to fight for pucks, lead the penalty kill, check hard and move larger opponents aside. Very accurate shooter with deadly hands that can deke defensemen and goalies out of their skates. An NHL star soon. Boqvist’s a cerebral and versatile, raw 18-year-old forward who continues to develop alongside adults in the Swedish Hockey League. His stealthy, shifty skating and puck skills compliment a knack for scoring, particularly flashy goals in the clutch. His first-step quickness and agility are especially dangerous on the rush, as he’s tough to contain both in open ice and heavy traffic situations. It’s difficult to disrupt Boqvist’s balance on skates, and he boasts two-way hustle that should translate favorably both on the man advantage and penalty kill at the next levels. He’s money around the net. A fearless competitor, Boqvist has the right moxie to grow physically and skill-wise into a valued Devils’ pivot. Zetterlund has a lethal shot and uses it, firing 143 SOG in 40 games this past campaign in Sweden’s SuperElit league. Add to that an almost point-per-game regular schedule rate, and three goals and two assists in seven U-18 World tourney contests with 28 shots and you have one of the best scoring 2017 draft-eligible forwards. The Devils may have stolen one here, as the 17-year-old has plenty of time to perfect his extra-heavy shot and quick release while traveling the NHL path. Protects the puck well and has impressive lower-body strength for his age and developing build. Will look to increase speed and boost defensive prowess. Popugaev, a large, lanky power forward at six-foot six, saw his one-time first round ranking among scouts and pundits drop amid concerns about his skating technique, acceleration and dedication. He is agile, lower-body strong and balanced on the ice though, featuring a heavy wrister, quick release and top-notch stick-handling ability. He’s particularly dangerous around the net, as his size and positioning instincts help set him up well for tip-ins and deflections. While his defense could use some work he’ll be a steal at this spot if the Devils can develop him properly. Senn is a large and athletic goaltender. At 6-05, 192-pounds he fits the current NHL trend and the Devils hope he develops into another Devan Dubnyk or Ben Bishop. At age 21 this is the third year he’s been draft eligible, but his profile and playing time increased significantly last year in the Swiss “A” League as he assumed the number one spot for HC Davos. His ceiling is high, revealed as his confidence seemed to grow in the second half of last year, raising his less-than-stellar early schedule stats to a 2.64 goals-against and .911 save percentage. Extremely quick in the crease, particularly for a big man, he still needs to master using size to his advantage as he can lose the puck in his pads or miss on-ice shots. Further game experience, coaching and practice should correct this. Blazing fast and smooth and elusive on skates, Studenic is highly gifted with the puck and an above average stick handler. The Slovak right wing displays sharp on-ice vision and can direct an offense with his playmaking, but can be inconsistent at times and bow under physical pressure. He’s played a great deal against older competition, so this may be part of his learning curve. He’s an asset on defense, especially when slowing opponents and blocking lanes with his stick work. With a knack for pressuring opponents and using his speed to hang close, he can hurry opponents into making turnovers. Finished last year, his first in North America while skating with Hamilton, with 18 goals and 12 assists in 58 OHL contests. Effective at even strength, on the power play or killing penalties, Talvitie’s a diligent, puck-distributing teammate with a dangerous and quick release on his heavy shot. Solid playmaking skills help him drive his line from the pivot, as does his ability to receive and fire pucks at the net in stride. Not huge at 5-11, 198-pounds he makes the most of his intuition and positioning chops as a defensive asset, utilizing quick skating speed and strong arms to knock opponents off the puck. Collects frequent penalty minutes with 155 in 164 Finnish juniors contests. Finished the U18 World Championships with four goals and three assists in seven games serving as captain for Team Finland. A 2018-19 Penn State commit. Probably best known as a Halifax teammate of Nico Hischier, Chainey’s a talented two-way defenseman prospect on his own merits. In last year’s second campaign with the QMJHL Mooseheads, the 17-year-old Asbestos native tallied four goals and 20 assists in 55 games, adding 44 penalty minutes. With Canada’s Under-18 WJC squad he landed four points, all assists, in five tournament contests. He’s intuitive on the ice- displaying cool composure which helps in the defensive zone, as do his solid positioning skills and quick skating. Moves the puck out of danger smartly. He could bulk up some to help handle stronger opponents. On offense he has power play quarterback experience to go with an accurate, rapid-release shot and precision passing. A confident and physically crushing blueliner that doles out mean and effective hits. Not the quickest, but he can get around reasonably well on the ice and is a skilled puck mover. Amassed 44 penalty minutes in 24 VHL games last year. Also not the largest of prospects at 6-0, 185-pounds but he’s strong and muscular, possessing a hard shot and decent playmaking ability. Zaitsev is a versatile special teams component, serving both on the man advantage and penalty kill. At 19, Hellickson is a puck-moving, strong-skating, overage prospect headed to Notre Dame for 2017-18. A Minnesota native with a left-handed shot, he was a two-year member of the United States National Team Developmental Program preceding 2016-17, dishing four assists in seven 2016 WJC-U18 contests. He spent last year wearing the “A” for USHL Clark Cup runner-up Sioux City’s blue line (6 goals, 22 assists and a 19-plus in 52 contests) earning a spot in the USHL/NHL Top Prospects Game. Praised for his poise, vision and passing ability. Forwards Pavel Zacha and Miles Wood and defenseman Steve Santini spent significant time with the big club, and many New Jersey prospects yet to have extended NHL play had promising 2016-17 campaigns. Michael McLeod finished his third OHL campaign with 27 goals and 46 assists in 57 Mississauga Steelhead regular contests and a 27-point, plus-17 run in 20 postseason games. He’s a true tough and physical force, even growing in that regard while decreasing his 2016-17 penalty minutes. A candidate, probably at right wing, to make the opening NHL roster and contribute meaningfully as a middle-sixer. Even though John Quenneville spent most of March lining up with Mike Cammalleri and Adam Henrique in New Jersey, he led their affiliate in Albany in scoring (14 goals, 32 assists in 58 games) as an AHL rookie and topped the team with four points (three goals and an assist), during their four-game playoff series with the Toronto Marlies. Another strong possibility to make the Devils’ roster at the start. After breaking with the NHL Devils out of camp and staying for three contests, Blake Speers further proved his mettle as a scorer with Sault Ste. Marie, recovering from an opening game broken wrist to finish with 15 goals and 19 assists in 30 regular season games, and adding one goal and seven assists in 11 OHL playoff contests. Mackenzie Blackwood gained traction as a pro starting 20 of Albany's final 26 contests and posting a 1.90 GAA and .925 SV% from the beginning of March until regular season-end. Impressively, much of this late-year run coincided with abundant New Jersey top prospect recalls depleting their AHL roster. His strong finish was punctuated by a shutout in his postseason debut and a triple-overtime, 106:43 marathon, 58-save, 2-1 loss to the Marlies closing their first-round series. After a bit of a late-year slowdown, Nathan Bastian closed the OHL campaign with 45 points in 58 games and tallied seven goals and seven assists during Mississauga's postseason run including a hat trick in their first-round series with Ottawa. Spending a significant time as a Steelhead center, he's a candidate to help shore up the Devils' wing play in 2017-18. Unfortunately, as time passes it’s looking more likely the Devils will lose Alexander Kerfoot, their unsigned 2012 fifth round selection, when he becomes a free agent on August 15. Kerfoot’s impressive 2016-17 campaign closed as his second-ranked Harvard squad bowed out of the Frozen Four Tournament after dropping their semifinal contest to eventual runner-up Minnesota-Duluth. The playmaking forward’s 16 goals and 30 assists with a 1.24 points-per-game average put him in the top-20 nationwide in overall scoring. Yegor Rykov’s SKA St. Petersburg club earned the KHL title besting Metallurg Magnitogorsk in the Gagarin Cup Finals four games to one. Playing for a deep team the promising, sizable blueliner with a good two-way game capped off his zero-goal, nine-assist, 49-game regular season with 15 postseason games. Served as an alternate captain for Russia’s 2017 U20 WJC team. Steadily-developing rearguard Colton White finished his fourth campaign in Sault Ste. Marie, with six goals and 25 assists and a plus-24 in 64 games, adding three postseason assists. Overall, White racked up 21 goals and 72 assists in 256 career OHL games with a plus-66. Defensemen (9): Michael Kapla, Steve Santini, Joshua Jacobs, Yaroslav Dablenko, Reilly Walsh, Colton White, Colby Sissons, Jocktan Chainey, and Jeremy Davies. 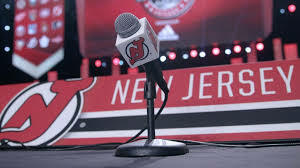 Forwards (20): Nico Hischier, Pavel Zacha, Michael McLeod, Nathan Bastian, Miles Wood, John Quenneville, Joey Anderson, Brandon Gignac, Brandon Baddock, Ryan Kujawinski, Jesper Boqvist, Fabian Zetterlund, Austin Cangelosi, Nikita Popugaev, Jesper Bratt, Marian Studenic, Robert Carpenter (invite), Blake Speers, Aarne Talvite, and Nicolas Guay (invite). Notable non-participants included: Alexander Kerfoot (RW), J.D. Dudek (C), Brett Seney (LW), Yegor Rykov (D), Mikhail Maltsev (LW), Yegor Zaitsev (D), Matthew Hellickson (D).